Here are a few things I learned about Otto Moreau. Otto claimed to have attended high school at the Lycee Montaigne near the Jardin du Luxembourg in Paris. The school sits atop one section of the catacombs. During World War II, the Luftwaffe (German Air Force) occupied the building and built what’s known as the Bunker Allemand (German Bunker) in the catacombs below. Otto’s explorations began at the age of twelve when his found an entrance to the bunker. The story cannot be checked since Otto’s real name remains unknown. A maze enthusiast, Otto postponed college in order to start his own business designing holly and hedge labyrinths for the country estates of wealthy French businessmen and aristocrats. His last project was a three-dimensional maze inspired by the catacombs. A fan of boudin noir—blood sausage (which I was forced to choke down in his honor). Mother is American. Spoke fluent English. 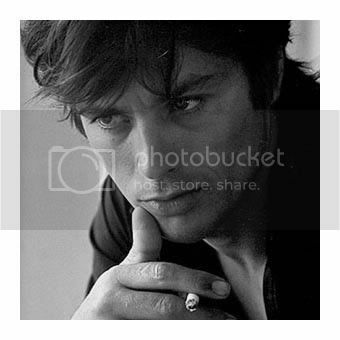 Resembled a young Alain Delon. Not bad. In 2001, he founded the Ariadne Society, a group devoted to the exploration and preservation of the catacombs. In early 2006, Otto announced he had made a discovery, but refused to share full details. He began to spend more time in the catacombs, and by March was rarely seen on the surface. He soon took to communicating with his friends through cryptic notes hidden in crevasses throughout the tunnels. Some made sense—others were rambling and incoherent. Many may not have been found. The last note asked society members to gather at “la pinacotheque” (art gallery), but did not provide directions. 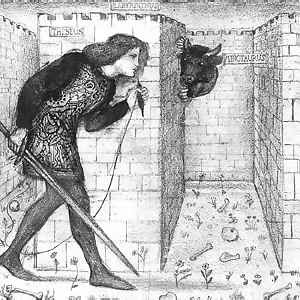 Theseus and the Minotaur, right?